Houzz 135 of our visitors have told a friend about this plan. Question: How tall is the ceiling in the bonus room above the garage? Answer: Those are the location of the beams at the floor system for the main level. Question: What are the dimensions of the eating area in the kitchen? Question: Would like to see a plan where stairs would be placed for a basement. Answer: Floor plan option for the basement version is already shown on the website. Question: Is there any alternative to square the wall between the kitchen and master? Also, I would like to see a sketch of a rear view if this house is built on a basement foundation. 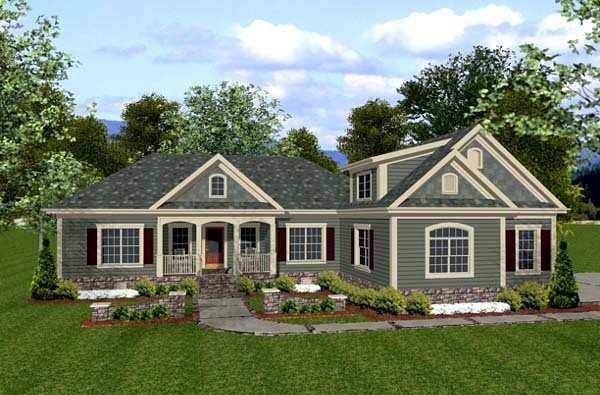 Answer: The rendering on the website of the rear is the same for the basement. Basement option is not a walkout. 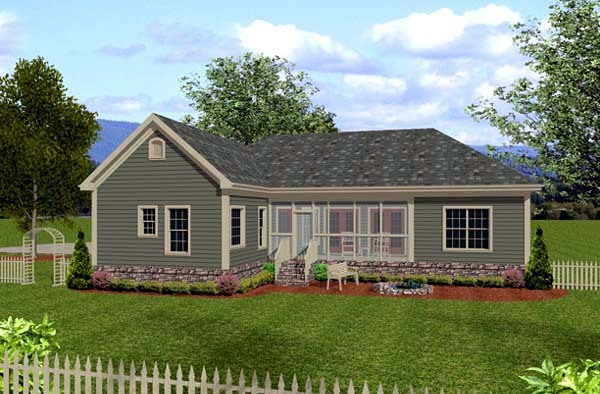 Client will need the plans modified for squaring up of the kitchen and master. Master needs to shift back to square up. Question: What is the square footage of the bonus room over the garage. Can it be used for living space, or is just like attic storage? Is there any more attic space in the house? Answer: Bonus room is 373 sq.ft. and it can be used for living area. There is no other attic space designed in the plan. 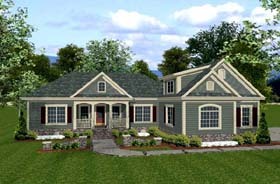 Question: We are interested in this plan but would like it with a basement foundation. We are just wondering what the floor plan would look like with the stairs to the basement and where would they be? Thank you! Answer: The second floor plan on the website shows the basement stair optional layout. Question: Where is the furnace, water heater/softener located? Also is mechanical included in the drawings? Answer: Plumbing and HVAC are not included. Mechanicals are not specifically located. They can go either in the garage, attic, or crawl space if applicable. Question: Is there under stair storage space that could be used as a pantry? Answer: There is storage but it can only be accessed from the garage. Question: What is sqft for cabinets and counter tops? Question: How tall is the ceiling in the garage? Answer: The clg in the garage is set at 8ft above the house floor elevation. So depending on where they set the final grade/garage slab, will determine overall garage clg hght. As drawn with the raised house scenario, the clg hght is about 10’-6” (with the garage floor set 2’-6” below the house floor elevation). Question: How big is the basement? And is there any rooms in the bssement plan or is it just an open space? Answer: Basement follows the main level as for size. The basement plan is left unfinished with some required bearing restrictions. Question: What size kitchen cabinets fit? Answer: I regret that I do not understand the question. Please provide more information as to what specifically is being looked at for the kitchen cabinets. Question: What are the closet sizes in the master suite? What is the size of the pass through from the kitchen to dinning room? Question: Do the plans include electrical and plumbing pages? Answer: Electrical yes, plumbing no. Question: What is the exterior color? Answer: There is no official manufacturer color code. It is simply chosen from a standard color pallet. Question: Can you tell me where the pantry is located please? Answer: There is no pantry. Question: Does the 1800sqft include the bonus room or is that an addition 503sqft? Answer: The 1800 sq.ft. does not include the bonus level. Question: Can I have the exact dimensions of both walls of the kitchen and island area and how much does the island angle, along with angle after the refrigerator? Seems like a odd layout. Is it a spacious kitchen? Island currently has an overhang for 2 to sit at. To lengthen the island they would need to expand to the right side and close off that specific opening to the eating.. Question: How long is the wall separating the eating and sitting areas? Answer: Wall is about 15ft long. Click Here to download a free PDF Brouchure of Plan Number 92385.